Not to be confused with Duffel bag. 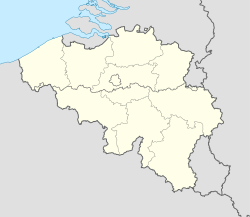 Duffel (Dutch pronunciation: [ˈdɵfəl]) is a municipality in the Belgian province of Antwerp. The municipality comprises only the town of Duffel proper. On 1 January 2006, Duffel had a total population of 16,019. The total area is 22.71 km² which gives a population density of 705 inhabitants per km². The town is the home of "duffel fabric", a coarse woolen cloth used to make heavy outerwear and tote bags. The etymology of Duffel is from "dubro" and "locus", from the Gaulish dubrum, dubron – "water". The town gives its name to a heavy woollen cloth used to make overcoats, especially for the armed forces, and various kinds of luggage. Items made from this material are sometimes spelled duffle as in duffle coat and duffle bag. ^ "Duffel". Online Etymology Dictionary. Retrieved April 27, 2011.